New paint on the interior walls can make a world of difference. Paint can fade after a while, but we can help to minimize fading with high-quality 100% acrylic interior paint. Furniture is relocated to the middle of a room so that it is out of the active work areas. Outlet and light switch plates are taken off before the start of a project and then put back upon completion. Drop sheets are laid down over floors. Stains are washed with TSP in order to keep them from bleeding through the new paint. Holes are repaired and sanded for a smooth appearance. Baseboards are caulked before painting is started. If primer is needed it will be put on after holes are repaired. Regardless of whether a new color is being applied or if it is the same color two coats of paint will be applied. For most projects we recommend a sheen of eggshell for a matte finish. We recommend a higher sheen of satin for rental properties, commercial properties, or kitchens and bathrooms so that it will have a more washable surface. We also recommend that you elect to use 100% acrylic paint because it lasts much longer, and it will save you more money in the long run. Regardless of what color you have or need we are able to match it. Should you be undecided about which color to use then we have color swatches available for you to choose from. 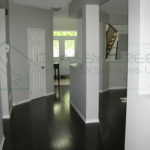 Our professional Apartment Painters have experience with projects big and small. Our painters can suggest the perfect colours for each room in your home… Let us help…!! !